Bagdikian, Ben H. 1992. The Media Monopoly. 4th ed. Boston: Beacon. Bennett, W. Lance. 1990. “Toward a Theory of Press-State Relations in the United States.” Journal of Communication 40(2): 103–25. Chomsky, Daniel. 1996. “Constructing the Cold War.” Unpublished Ph.D. dissertation, Northwestern University. Devereux, Erik August. 1993. “The Partisan Press Revisited: Newspapers and Politics in the United States, 1964–1968.” Unpublished Ph.D. dissertation, The University of Texas, Austin. Gans, Herbert J. 1980. Deciding What's News: A Study of CBS Evening News, NBC Nightly News, Newsweek, and Time. New York: Random House. Hallin, Daniel C. 1986. The “Uncensored War”: The Media and Vietnam. New York: Oxford University Press. Iyengar, Shanto. 1991. Is Anyone Responsible? How Television Frames Political Issues. Chicago: University of Chicago Press. Iyengar, Shanto, and Kinder, Donald R. 1987. News That Matters: Television and American Opinion. Chicago: University of Chicago Press. Jamieson, Kathleen Hall. 1992. Dirty Politics: Deception, Distraction, and Democracy. New York: Oxford University Press. McCombs, Maxwell E., and Shaw, Donald L. 1972. “The Agenda-Setting Function of Mass Media.” Public Opinion Quarterly 36:176–87. Page, Benjamin I. 1995. “Speedy Deliberation: Rejecting ‘1960s Programs’ as Causes of the Los Angeles Riots.” Political Communication 12:245–61. Page, Benjamin I. 1996. Who Deliberates? Mass Media in Modern Democracy. Chicago: University of Chicago Press. Page, Benjamin I., and Shapiro, Robert Y. 1992. The Rational Public: Fifty Years of Trends in Americans' Policy Preferences. Chicago: University of Chicago Press. Page, Benjamin I., Shapiro, Robert Y., and Dempsey, Glenn R. 1987. “What Moves Public Opinion?” American Political Science Review 81:23–43. Page, Benjamin I., and Tannenbaum, Jason. 1996. “Populistic Deliberation and Talk Radio.” Journal of Communication. Forthcoming. Parenti, Michael. 1993. Inventing Reality: The Politics of News Media. 2nd ed. New York: St. Martin's. Patterson, Thomas E. 1993. Out of Order. New York: Knopf. Protess, David L., Cook, Fay Lomax, Doppelt, Jack C., Ettema, James S., Gordon, Margaret T., Leff, Donna R., and Miller, Peter. 1991. The Journalism of Outrage: Investigative Reporting and Agenda Building in America. New York: Guilford Press. Reese, Stephen D., Grant, August, and Danielian, Lucig H. 1994. “The Structure of News Sources on Television: A Network Analysis of ‘CBS News,’ ‘Night-line,’ ‘MacNeill-Lehrer,’ and ‘This Week with David Brinkley.’” Journal of Communication 44(2):84–107. Rowse, Arthur Edward. 1957. Slanted News: A Case Study of the Nixon and Stevenson Fund Stories. Boston: Beacon. Sigal, Leon V. 1973. 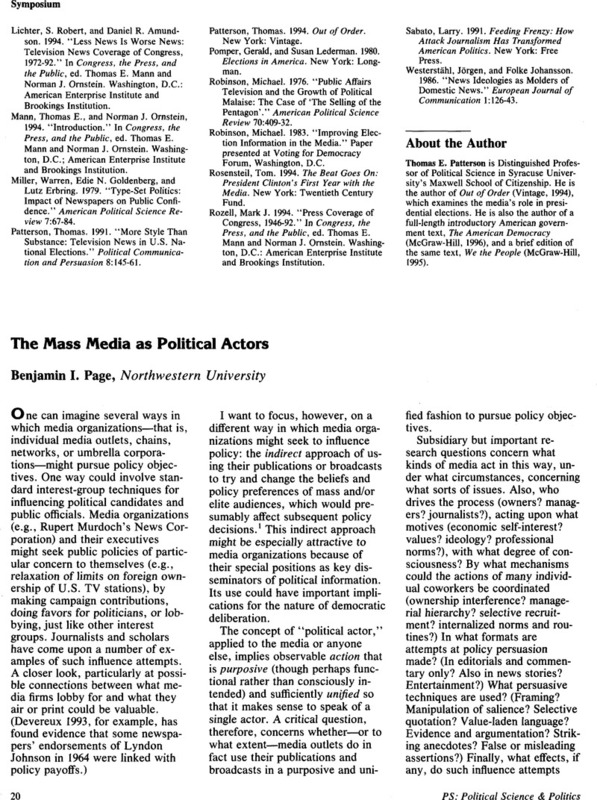 Reporters and Officials: The Organization and Politics of Newsmaking. Lexington, MA. : D.C. Heath. Soley, Lawrence. 1992. The News Shapers: The Sources Who Explain the News. New York: Praeger.